When the Torah speaks of biblical leprosy, we must keep in mind that this is not the same as modern leprosy. Modern leprosy is a bacterial infection also known as Hansen’s disease. Although it can be a debilitating disease, it is completely treatable if caught in time. Biblical leprosy, known in the Hebrew Scriptures as tzara’at, is not caused by a bacterial or viral infection, and it has no known prescriptive cure. However, it only affected one’s status of ritual purity and communal participation. Let’s take a brief look at tzara’at and a few of its appearances in the Torah. We only have two recorded instances of tzara’at in the Torah. The first was when Hashem encountered Moses at the burning bush. Hashem told Moses to put his hand in his cloak, and when he pulled it out the Torah tell us that it was “leprous like snow” (Exodus 4:6). This was the result of Moses objecting to Hashem’s instructions to speak to the Children of Israel regarding their salvation. He said, “But behold, they will not believe me or listen to my voice, for they will say, ‘The LORD did not appear to you’ ” (Exodus 4:1). The other occurrence is where Miriam is temporarily stricken with leprosy. The Torah records that Miriam “spoke against Moses because of the Cushite woman whom he had married, for he had married a Cushite woman” (Numbers 12:1). As a result she was stricken with tzara’at for seven days. In both of these instances, the person inflicted was guilty of slander—Moses against the Children of Israel, and Miriam against Moses. There are several unusual characteristics about tzara’at. First, a person who has tzara’at is called a metzora. However, when a person had the symptoms of tzara’at it did not automatically mean they were a metzora. They could only be officially declared a metzora by the official diagnosis of the priest (see Leviticus 13). Once a person was declared to have biblical leprosy, they were declared ritually unclean and had to remain in isolation outside of the Israelite encampment. Another unusual characteristic is that if the tzara’at spread to the point at which it covered the entire flesh of the metzora, the priest was to reverse his status and declare him ritually clean (Leviticus 13:17). If this were an infectious disease, such as Hansen’s disease, then declaring him ritually clean would be counter-productive and a liability to the community. Surely there is something more going on than meets the eye. 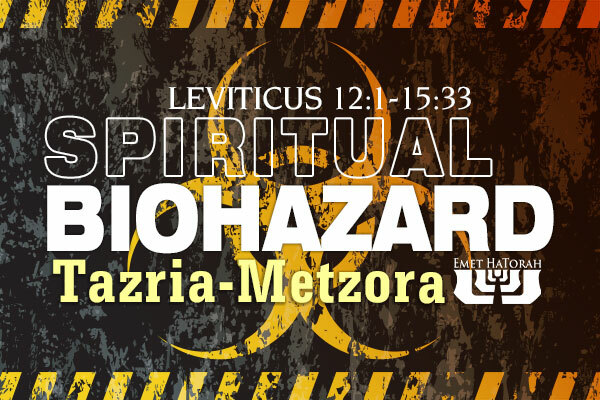 In Hebrew, the word metzora has the same letters as the phrase motzi [shem] ra, which means “causing an evil [name or reputation].” From both the spelling of the word, as well as these two events recorded in the Torah, the sages connected tzara’at with lashon hara (evil speech). Tzara’at was only contracted due to gossip and slander, and was a supernatural disease that was only in effect in a time that the Tabernacle or Temple stood. Tzara’at was not a pathological biohazard as one might think, but a spiritual biohazard. It seems Hashem was extremely concerned about how His children spoke of one another and took extreme measures to show the severity of it. How does this apply for us today? There is a valuable lesson to learn when we understand the details of tzara’at. Just because we don’t have the outward manifestation of tzara’at today doesn’t mean that we can freely slander our brothers and sisters without fear of consequence. Studying the laws of this consequence that Hashem designated for slanderers is a constant reminder that although we may think we can get by with something that doesn’t seem so bad in our eyes, the dignity of another person is always esteemed in the eyes of our Creator. We may not see any consequences today, but one day the books will be opened and our actions revealed for all to see. May we be reminded about the laws of the metzora and may our speech be pure at all times.